When we were in the Fire Country, demons have started rampaging again. The demon birds seem to be under someone's control, and started attacking humans! Are you Naraku's minion, too?! The Poison Insects around you are evidence! I don't like to hit women, but what you've done is unforgivable! She might be related to Naraku... but she doesn't seem to be under his orders. 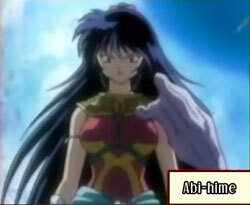 Next on Inuyasha, "The Wild-Tempered Bird-User, Abi-hime". What...?! She managed to dodge the Wind Scar! Their blood has been sucked... I wonder if it's a demon like Grandpa Myoga...! KAG: The place where the fragment lie... The boundary between this world and the next. The gate in the Fire Country has closed. While searching for an alternate route, a new enemy appears before us!